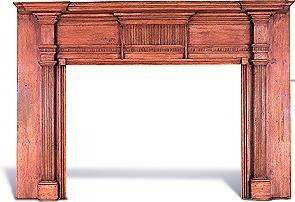 We feature more than 150 American antique fireplace mantelpieces from all of the Colonial capitols -- all sizes, dating from 1750-1850, and refinished with hand-rubbed patina surfaces. Starting at $700 and ranging up to, for unique examples, $30,000. Experience the charm and beauty of the historic fireplace for your home. This piece is from our extensive collection of English, American, French and Russian authenticated antiques. Three floors in a gallery setting await your selection. © Copyright 2001 Francis J Purcell. All rights reserved.